Rail to the North Shore is really expensive. Well yes it is, but not nearly as expensive as building a $5 billion road tunnel. The North Shore already has a busway, why does it need a railway line? And here’s where things get interesting – read on! 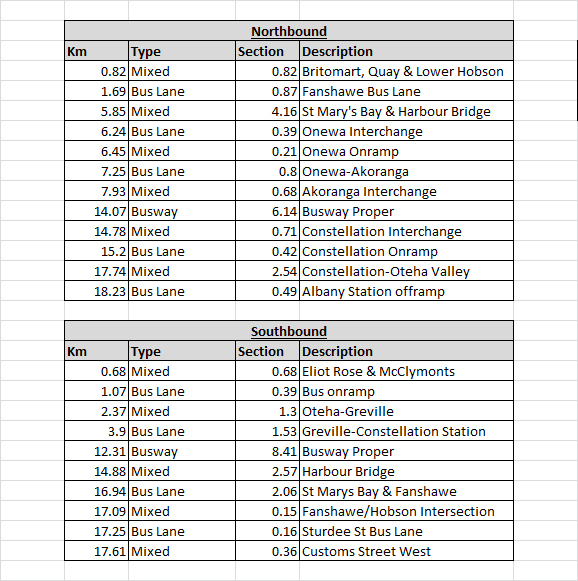 While the North Shore certainly does have a busway – a very successful one at that – we must remember that the busway proper is only between Constellation and Akoranga Stations in both directions, then between Akoranga Station and the Onewa Road interchange in the southbound direction. In some other places there are bus shoulder lanes, but that’s it. When you actually start to map out how much of the Northern Express route (the core route along the busway) is busway (blue) bus lane or shoulder lane (green) and mixed traffic (red) the result is actually somewhat surprising: Breaking down the distances, you can see that northbound passengers in particular get a pretty raw deal: Total it all up and you actually find that only 41% of the Northern Express’s route is actually along the busway proper. A full 40% of the route is without any form of bus priority measures at all – including half of the route for northbound buses. Most worryingly the places with some of the patchiest bus priority measures, like the Harbour Bridge, St Mary’s Bay for northbound traffic and around the Britomart departure points are the very places where bus volumes are the highest and the competition for road space is most intense, with buses sadly losing out. For example, the fact that NZTA didn’t bother to put a northbound bus lane through St Mary’s Bay when widening that motorway speaks absolute volumes of the disdain that organisation has for public transport. 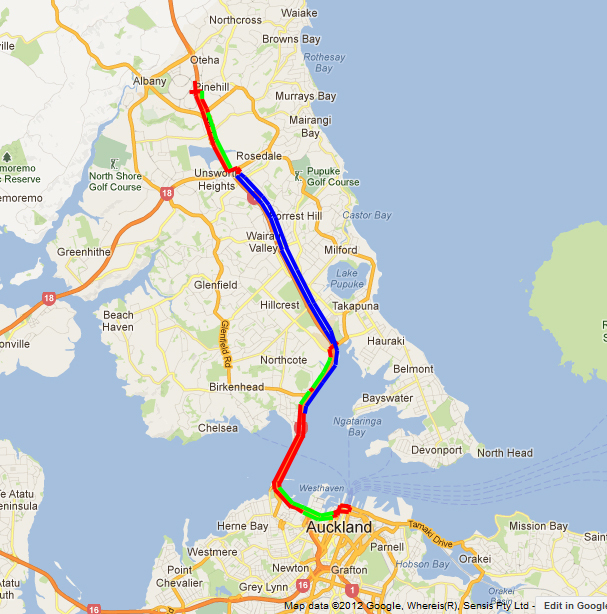 The point of all these calculations isn’t to criticise the Northern Busway, but actually to point out that a railway line south of Akoranga – like the rail line shown below – wouldn’t actually duplicate much of the busway at all: just the southbound section between Akoranga and Onewa which would be very handy for minimising the length of a cross-harbour tunnel: Furthermore, this is pretty much exactly the same section which NZTA’s Additional Waitemata Harbour Crossing Project adds capacity to – at a cost of at least $5 billion (a rough estimate based on past analysis suggests that a Takapuna to Aotea rail link should be able to be built for under $2.5 billion). After all, the only thing AWHC does is shift ‘through-traffic’ off the harbour bridge into a new tunnel and then turn the harbour bridge into giant on and off ramps feeding a heap of cars into downtown that we don’t actually want. For $5 billion! Clearly in the meanwhile there are things we can do to improve the busway and increase the measly 41% total. An extension northwards from Constellation to Albany is a no-brainer. Improved priority measures in the inner city is another clear requirement, plus we need to do something about getting a bus lane northbound through St Mary’s Bay. But for goodness sake, before we go and spend $5 billion on a road tunnel that’ll do nothing but feed cars into downtown, can we consider a much cheaper and much more effective alternative? I splutter when people describe the busway as being part of the “Rapid Transit Network”. And yes better to grab a lane for those remaining pieces now before it gets jam-packed, by which point it’ll be too late/difficult. If traffic volumes on the harbour bridge keep falling, it would be easy to claim one of those lanes coming out of the Victoria Park Tunnel and keep it going across the bridge, no tunnel needed! Around half of all people crossing the AHB do so in a bus today, yet all lanes are for cars. Really? I thought less than 10m p.a. used the northern busway. Next step would be getting a bus/transit lane over the harbour bridge southbound, I expect. Just under half the people during the two-hour AM peak, not half the people overall. I think the connection from Aotea to Wynyard is something that could perhaps be put in ahead of the rest of the tunnel as a way of making the area super accessible as its eventually meant to have something like 14k new jobs but there are already quite a few just outside that area that would be within range of the station. Certainly route protection and station planning ought to be happening, but of course it must be hard to properly plan for the medium term when so much energy has to spent defending current plans and projects against the backward looking ideologs in government [elected and officials] and the vested interests of the road lobby. I think 14k is not too many is the scheme of the 132k that was highlighted the other week on this blog. I think people over estimate the effect of Wynyard Quarter on CBD development. Is one of those sill arguments used by anti CBDRLers that it misses Wynyard. Mostly be low rise development too, unlike potential development sites in the CBD proper. The Frequent network and in the long term light-rai extension will serve Wynyard very well without having to spend near $1 billion on a very expensive portion of the North Shore link. Would cause real issues with maintenance etc as nowhere to build new depot on that section of the line. Depot should be built at Wairau Park btw, demolishing a bunch of those big-box stores which will be then suffering due to high fuel and poor/inefficient PT options. I think the type of network that’s implicitly proposed by that diagram is actually an excellent one. The rail connection goes direct to Takapuna (which is in sore need of a direct route to it), while the busway is left as a feeder to Akoranga station; everyone gets off their bus their, and on to a train. An easy, timed transfer, that also allows busway passengers to go direct to Takapuna when they get off, and not just the city. Sorry Luke E – Takapuna to the CBD has one of the fasted, most successful bus routes in the region via the Esmonde Road bus lane. Not yet polluted with HOVs. Can you beat 15 minutes from any suburb into Downtown? Akoranga Station is 2 km from most of the existing residential area. You left off Onewa Rd station Peter! He’s probably thinking that we will need this before those nimbys that prevented a busway station there die off and therefore they will stop it once again. A station at Onewa for the busway was originally part of the plans but the local nimbys killed it off. I agree. The Northern Busway will be so much better with a dedicated busway link from Aotea to Wynyard rather than having to use congested surface streets. southbound, there’s clearly room to extend the bus shoulder through to the vicinity of the lane MLB machine garage and I agree, there’s definitely a case for dedicating the east most clipon lane to buses in the morning, does the bus only sign from the Curran St offramp still operate? I wouldn’t be so sure that the busway would have to cross the motorway. The NZTA is already talking about widening the motorway through to Greville along with a new interchange there and as part of that I suspect they would do so by shifting the northbound lanes to the west to enable the busway to carry on up the eastern side. If they went all the way along the eastern side then they could just bring buses off at McClymonts Rd. That could save a bit of money. Is it possible to build a bus tunnel (like the one in Wellington) that could eventually be converted to a rail one? Possible yes but it would be much more expensive due to the need for things like ventilation for the exhaust fumes, possibly a higher level of fire control systems etc. Who is going to tender for such a large project, a domestic or foreign owned company? – surely the skills and technology needed to build this link are based outside NZ. Thats an estimated 4b going offshore right? – as opposed to motorway and tunnels which on the most part are built by FBU, i.e. a large percentage kiwi owned. Strange assumptions. A consortium led by FBU are building two much bigger diameter tunnels under Waterview right now. Why wouldn’t they want to build this too? I’m sure they’ll have a go for the CRL work too. The TBMs won’t be made here, they’ll be bought in along with other expertise no doubt, but that hardly means the contract itself needs to go offshore, unless the locals are in the habit of padding their tenders measurably….? Little faith in Fletchers or other local consortia’s abilities? Yes that is a bit strage, are our large constructions firms really so specialised that they can build motorways till the cows come home but would be hopelessly stumped by a public transport tunnel?! So you argee the contract needs to stay onshore otherwise no deal? Well I certainly would prefer it, but I wouldn’t kill a vital project if the local contractors are completely uncompetitive. Especially as all the work will happen locally and the flow on effects for local firms will be huge no matter who has the main contract. Unlike when Kiwi Rail and the government went out of their way not to build all those freight wagons in Dunedin which both threw skilled workers out of work and lowered the value of KR’s workshop asset. Quite apart from the forex loss and general loss to local economy…. I find it even more stranger than you assume FBU is the one who will win the contract. Even though all there resources at pointed at other projects.. Thats one massive assumption! I assume that Fletchers will tender for the contract, doesn’t mean they will win it but that is the nature of tendering. Resources on other projects won’t be an issue as this thing, or even motorway tunnels won’t be starting for possibly decades. Matt, if the money were to go offshore (billions = % of GDP) do you agree we should still build? FBU, in the year to June 2011NZ spent 7.1 billion importing oil and 4.8 billion importing cars: Nearly 12b offshore year after year; we’re junkies to our infrastructure. Investing in reducing auto-dependency will save the country multiple billions over time. We really have to get over this habit of pork-barrel infrastructure decision making and understand the whole of life costs. In Auckland this can be aided enormously by finally building a complementary Transit network to the widespread road one, with a core electric rail system. And we make our our own electrons, mostly renewably [c.80%], and even the thermal generation uses local inputs [gas, coal]. Most of the costs would be construction related and likely to have to go towards either staff or material that would be sourced locally. Also just because a company may have started or be based here, how many of their investors are locals? When projects like this are assessed, the fact the construction company may or may not be local isn’t taken into account so if it stacks up then yes it should still go ahead. Why is it so difficult to get a straight answer from you lads?.. If FBU spends money offshore to create profits onshore what is your argument about!!? Your asking for the goverment to spend billions without profit. This is my argument! Again I will ask, do you agree we should build this loop if the contract goes offshore?.. yes or no. And, I thought you guys were advocates for this type of expertise staying onshore, so if the tender were to go offshore say goodbye to billions in GDP without profit and very little job creation. We are advocates for getting improved and balanced transport infrastructure. We have never said anything about who builds it or where they come from. Transport infrastructure is build based on the impact that it has, not who builds it and that is the way it should stay (we do however think that generally the way we assess projects is wrong but that isn’t relevant in this point). Again any profits from such projects ultimately are for the shareholders of the companies who build it and they could very well be off shore even if it is a ‘local’ company. Huh? Now you are really making no sense at all. Infrastructure spending is not a profit making business. No road makes a profit. The government is not a business, it does not spend to make a profit, hospitals, schools, the army; none of these make profits and nor should they. You are conflating different things, do you really not understand this? I couldn’t care less if a foreign company builds it, if they can do a good job on time and at the right price so be it. If we want expertise in tunnelling, then lets go to the Swiss or Japanese or the Chinese, they are the global experts. Why try and reinvent the wheel here? Depends is you’re sweating about your FBU shares…..
Patrick, the goverment spends to grow GDP, it collects its revenue from taxes just like tax on oil. How can you say no road makes a profit!!?! !… Your in the labour & greens dreamland again mate! And transport projects are assessed amongst other things on their impacts to the economy independent of who builds the thing. Roads and rail don’t make a profit but they are enablers to allow other industries to do so through the movement of people and freight. If roads were about profit directly then we would be building things like bypasses or Waterview as they are intended to enable cars to get around faster. You also seem to think that this blog is aligned with certain political parties. We are not and our writers and readers come from all sides of the political spectrum. FBU, profit is a financial term not an economic one. Growing the economy is an economic aim and is not measured by profit and loss in government investments, but by economic costs and returns on investment, which are almost all non-fiscal. Of course the financial and the economic are intertwined but failing to grasp the difference, as you clearly exhibit, is a pretty basic misunderstanding. And no road makes a profit. All roads are subsidised by taxes and rates. Please show me the profit and loss accounts for a road… You can’t; they don’t exist, even the ones that are tolled. Of course we would like the NLTF to be run in a ‘business-like’ way which is to say efficiently and with an eye on value for money, but this doesn’t make it a business. It is a fund full of tax dollars spent by public servants, on networks and systems evaluated on an economic basis for the general good [well or poorly is another matter]. Local rates also cover 50% of non-statehighway roads. Profit and loss doesn’t come in to it. Virtually socialism; if you must bother about labels.